On Saturday I lined up with a bunch of soccer playing kids to get a piece of excellent cake from Southern Sweets in Decatur. Dad was visiting and we went with the cousins to try a piece before going to the DeKalb Farmer's Market - that's quite a find, too if you haven't been there. The farmer's market has foods from around the world and a clientele to prove it. 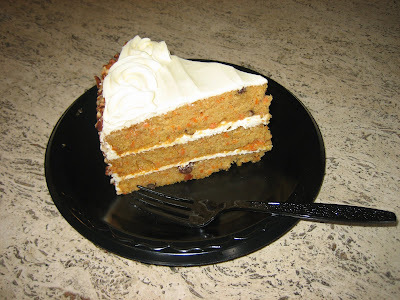 I definitely want to go back to Southern Sweets - great looking desserts and their lunch menu looks delicious, too. Update: I've been back here several times and enjoyed a piece of red velvet cake over the weekend (3-28-09). 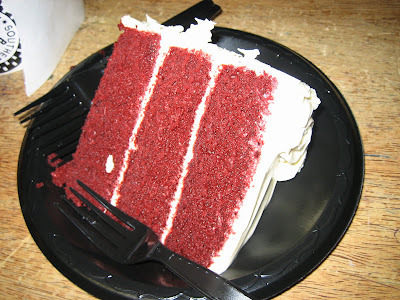 Red Velvet Cake - very tasty - I love the cream cheese frosting. Look at my hand compared to that plate! 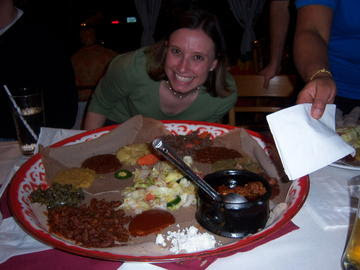 Yesterday I went out with a group of friends to Queen of Sheba, one of the better Ethiopian restaurants in Atlanta. Luckily we had enough people to order the GIANT platter of food, getting tastes of beef, chicken, lamb and vegetarian dishes. Ethiopian cuisine is one that I cannot eat often, but when I get a craving for it I can't stop myself. 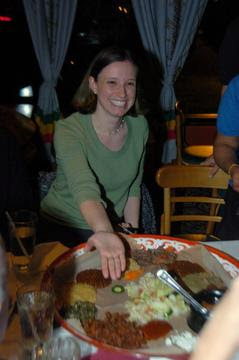 You use your fingers to hold pieces of injera (sourdough-like flat bread made from a grain called teff), which you use to eat the various stews that come on the platter. Afterwards, you eat the injera soaked with all the yummy juices. My favorite is usually the lamb, especially with the red awaze sauce that you can get mixed in or on the side. The collards are also notably good as are the potatoes, cabbage and carrots. On Thursday evenings, Queen of Sheba has live jazz beginning at 8 PM.